Does It Make Sense to Stay in a Hotel Anymore? 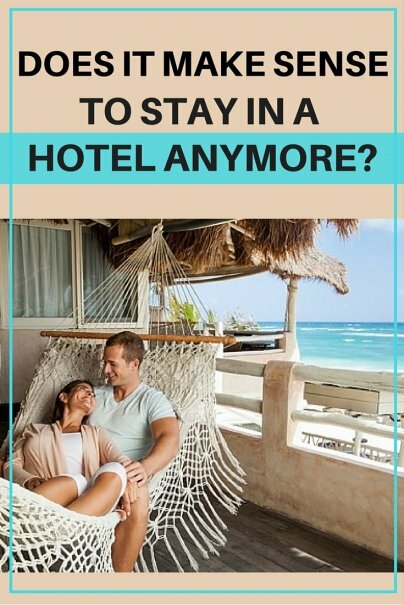 Home » Frugal Living » Travel » Does It Make Sense to Stay in a Hotel Anymore? Staying in a hotel isn't necessarily the cheapest option, especially when you're staying in a big city, like New York City. However, before you book that apartment on Airbnb, you should consider the various advantages of staying in a hotel. When you have a complaint at a hotel, all you have to do is call down to the lobby and let them know. If you want to take it one step further, you can ask to speak with a manager. This will usually result in discounts, upgrades, and just about whatever you ask for. When it comes to Airbnb, there is really nobody to complain to. If you are unhappy with your stay, you're stuck there anyways. At the end of your trip, if things don't go as planned, you may get a full or partial refund on your stay at a hotel. However, if you're booking a short-term rental, you likely won't get a discount. With Airbnb, you will likely have to deal with the hosts — before you book your trip and throughout your stay. Some hosts can be less than welcoming or accommodating. At a hotel, your interaction with hotel staff should be minimal, and they are expected to act in a professional, corporate manner. We've all heard the horror stories of black light findings and rumors of how filthy hotel rooms can be. However, have you considered how clean an Airbnb apartment may be? The owners aren't held to any standards, so you may be sleeping in a bed with dirty linen or using old towels. At a hotel, you can expect daily housekeeping, whereas with Airbnb, you're on your own to make the bed, empty the trash, and clean up after yourself. This can result in a tidy hotel versus an unkempt and unorganized Airbnb apartment. When it comes to a hotel, only the front desk and housekeeping should have a key to your room, so you can rest assured that no one should be coming in at night. On the other hand, with Airbnb, you have no idea how many people have the key to the apartment you're staying in, which may might you feel uneasy at night. Hotels also usually have security on the premises, security cameras, computerized door entry cards, and even room safes for enhanced security. Staying at a hotel feels more like a vacation from everyday life. It is a break from the normal daily grind. On the other hand, staying in someone's home on Airbnb may feel more like staying at home, with similar responsibilities. You can book a hotel room for as little as one night, whereas with Airbnb, you usually have to book multiple nights. If you are expecting a late night arrival, a hotel is usually very flexible with the check-in time, whereas an Airbnb apartment usually has early check-in times that cannot be negotiated. Many avid travelers have made the case for Airbnb that staying in someone's home will allow you to find local favorites and get expert recommendations from your host. However, you can get the same experience from a hotel. Simply ask the concierge for recommendations, directions, and advice about the area. Staying in a downtown or metro area will also automatically put you in touch with some of the best things the area has to offer. If you don't get what you see in the hotel's description, you can simply complain and they'll have to hold up to their end of the deal. On the other hand, Airbnb descriptions and photographs can be very misleading, so you don't always get what you're expecting. Is Airbnb Still the Best Choice? There are still a number of important reasons to consider short-term rentals. According to Priceonomics, compared to the average hotel room, you can save up to 50% by renting a private room on Airbnb, and up to 22% by renting an apartment on Airbnb. Those are substantial savings. You'll also have access to an entire apartment, including a kitchen and living area, as opposed to just a cramped hotel room. If you'll be staying in a popular area, like New York City, make sure to carefully weigh your options to determine if a hotel or Airbnb is right for you. Do you know of other reasons to stay in a hotel? Have you had experiences at a hotel or Airbnb you'd like to share? Please share your thoughts in the comments! My recent experience with Airbnb was not good. Turns out to be a Bed and Bathroom (shared). Room was on the 3rd floor of a house in a nicely rehabbed neighborhood in St. Paul Mn. Stairs to the 3rd floor were uneven, and narrow, there was no TV and no AC, only ceiling fans, and the bed was more futon sized than than a fullsize bed. I will say that once we had the WIFI codes the internet access was good. I spent 2 nights there and will never do it again. The price was reasonable, but from here on out, I'll be searching moderately priced motels.